Iterative design is the process of continual improvement, of a concept, prototype, design or product. 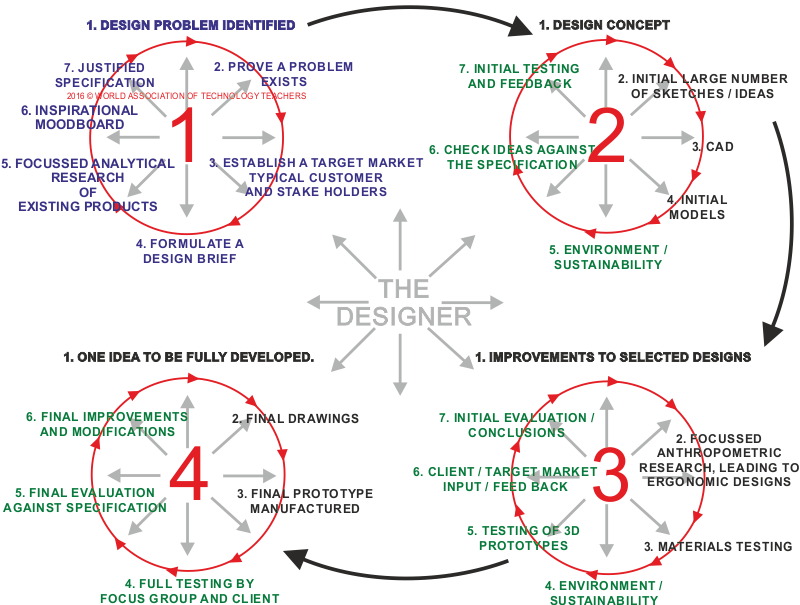 It is a cyclic approach to the development of a product, whereby a design is improved by frequent testing, client feedback, focus groups, materials testing, prototype testing, design development and evaluation, until a final refined / developed design is reached. It differs from the linear approach to design, where by the designer goes through a number of predefined stages, one at a time, until a conclusive design is reached. The Iterative Design Cycle works at it’s best, when a student understands how each of it’s individual components (we call them ‘design tools’) can be used, to help in the design and development of a product. Example 1: If a student understands the purpose of a questionnaire / survey and how to conduct one, he/she will be able to decide when to apply this tool to the iterative design process, (and how many times). This applies to each ‘design tool’, including CAD, thumbnail sketching, model making. Each design tool can be utilised many times, during the iterative design process. Example 2: The ‘design tool’ called ‘feedback’. If a student knows how to record feedback, what to ask potential customers and stakeholders and how to turn the gained knowledge into an improved design, this skill can be used regularly, during the iterative design process. There is no set way of designing. The student has freedom to use the ‘design tools’ at his/her disposal at any time, whilst designing at product. IMPORTANT - Following the iterative design process, the designer can jump between cycles or utilise any of the ‘design tools’, in almost any order, any number of times, until a final product is manufactured and evaluated. This iterative design process is for guidance only. Teach students a range of ‘design tools’, such as CAD, feedback skills, research skills, analytical skills, model making, manufacturing skills etc... through short projects, at KS3. Consider teaching the individual cycles 1 to 4 (opposite), as separate projects at KS3, to build the skills required for iterative design. Allow and encourage individualism. There may be no need to follow each cycle completely. Allow students the freedom to use their initiative, even ‘jumping’ back and forth from one cycle to another. Start by writing a design problem, after consultation with potential clients / customers and stakeholders AND write a design brief. The rest of the iterative process can be loosely followed, depending on the student and the product being designed. Always encourage sketching, model making, feedback, acting on feedback, design improvements. In essence, design, develop, test, evaluate and repeat this process until reaching the final design.